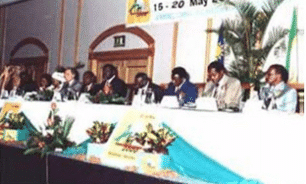 Africities 2, in Windhoek, in May 2000, was held on the theme “Funding African local governments to ensure the sustainable development of the continent”. This summit marked the beginning of the structuring of the African local authorities movement and the Pan-African dialogue on decentralization and local development. It prepared the setting up of an All-Africa Conference on Decentralization and Local Development (AMCOD) with the aim to include decentralization among priorities of the African political agenda; and a Council of Cities and Regions of Africa (CCRA), with a view to building and representing the unified voice of the African local governments. In Africa, decentralization is a broad initiative, which is mobilizing many stakeholders. In Windhoek, the African Interdisciplinary Network of Inhabitants (Association for the emergence of citizen militancy among the Inhabitants in Africa) described joint production as a pledge for participatory democracy and an essential lever for good decentralization, the joint production involving three actors: elected officials, professionals and citizens. The Africities 2000 delegates retained and supported this need as a premise for the local governance. The participants agreed that urban safety is an essential element for the sustainable development of cities (economic, social and cultural). It is a basic service which should be accessible to all citizens. Moreover, it is a concern for every citizen, and in particular for the poor, who are affected most by urban insecurity since insecurity plays a major role in hindering the possibility for the poor to break the cycle of poverty and fully participate in development efforts. This is particularly true for women affected by domestic violence as well as by other forms of crime.